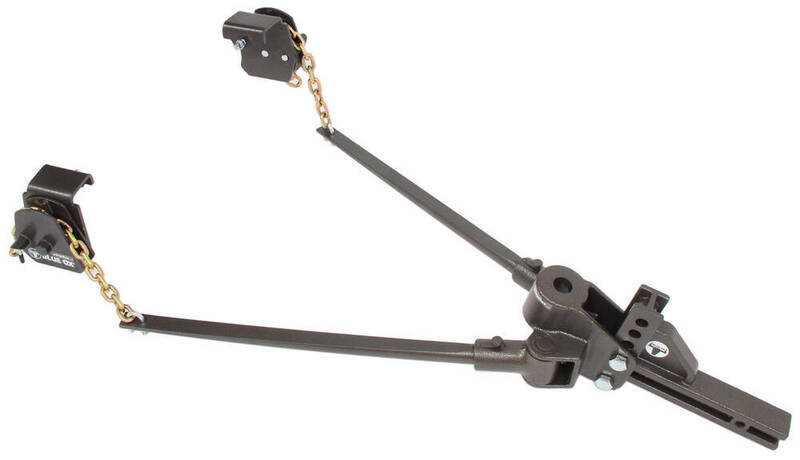 Shank fits 2" hitches and offers up to an 8" rise and a 2" drop. Clamp-on system uses optimal points of tension to help prevent sway while it balances your trailer's load for a more level ride. Works with underslung couplers. Lowest Prices for the best weight distribution from Blue Ox. Blue Ox SwayPro Weight Distribution w/ Sway Control - Clamp On - Underslung - 8K GTW, 750 lbs TW part number BXW0753 can be ordered online at etrailer.com or call 800-298-8924 for expert service. Trailers with frame height between 3" and 6"
Total height adjustment along shank: 8-3/4"
Create a stable ride for your tow vehicle and trailer with a weight distribution hitch. Adding spring bars to your towing system applies leverage, which transfers the load that is pushing down on the rear of your vehicle to all the axles on both your tow vehicle and your trailer, resulting in an even distribution of weight throughout. The result is a smooth, level ride, as well as the ability to tow the maximum capacity of your hitch. The tongue weight rating is the most important factor in determining which size weight distribution system you should use. If the bars of the system you choose are rated too high for your setup, they will create a rigid ride, which can result in a bouncing trailer. If, on the other hand, the bars are not rated high enough, the system will be unable to properly distribute the weight, rendering it virtually useless. To determine the proper weight rating for a weight distribution system, you must first determine your trailer's tongue weight. Then add to that the weight of the cargo behind the rear axle of your tow vehicle. These two measurements make up the tongue weight rating for a weight distribution system. Unlike other weight distribution systems, the SwayPro has automatically locking brackets throughout. Both spring bars insert, slotted side up, into the head assembly and then lock securely in place. Removal is just as easy - simply lift the locking pins on the trunnions and slide the bars out. Blue Ox spring bars are interchangeable with each other. If you buy a new trailer or tow vehicle and you need to increase or decrease your capacity, you can simply buy new spring bars instead of purchasing a whole new system. Other systems have lift brackets that require you to apply a good amount of leverage to get them to snap up, which can be difficult and frustrating. With the SwayPro, all you have to do is insert the lift chain into the bracket slot and rotate the bracket with the included wrench until the lock pin engages. Another feature of the SwayPro is the easy-to-use head. The required pitch is already built into the head, so the only adjustment that may be needed is the placement of the head on the shank. Move the head up or down along the weight distribution shank to achieve the proper height. No additional, fine-tune adjustment is needed, which means no hard-to-access washers or difficult-to-use thumbscrew. The SwayPro offers four points of built-in sway control. 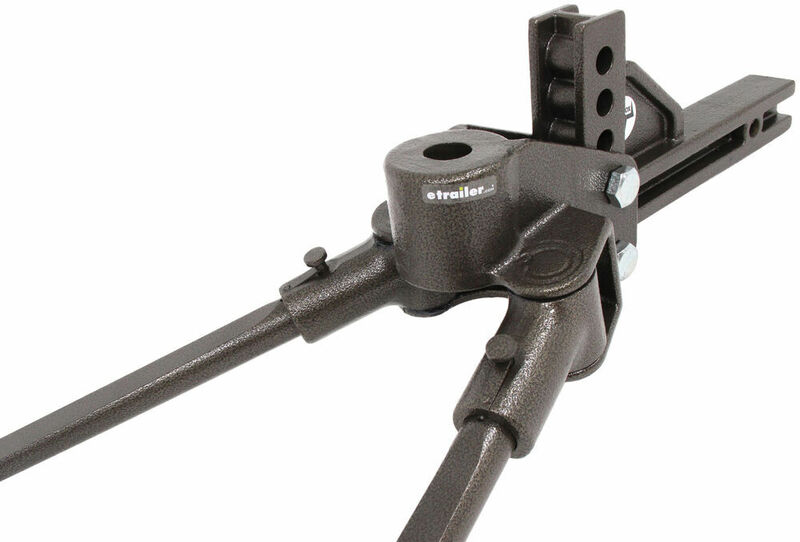 Within the head assembly, the trunnions are designed to hold the spring bars securely in position, placing just enough tension on them to cause them to constantly force your trailer in line. At the other end of this weight distribution system, the rotating brackets ensure that the lift chains are pulled as taut as possible. In addition, the basic design of the brackets keeps much of the length of the lift chains wrapped up inside of the brackets. Typically, only a couple of links hang down from each bracket. So each chain is held more stable than in traditional weight distribution systems, where more than twice as many links are exposed. 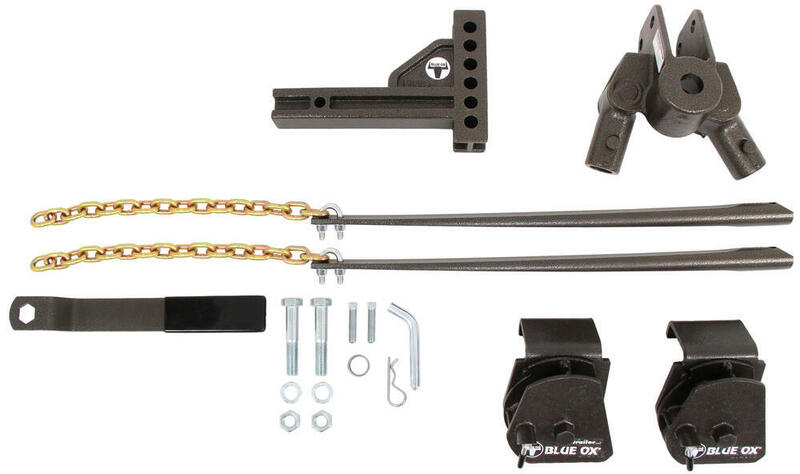 This tight, stable design limits the movement of the spring bars so that they can exert more force on your trailer to effectively keep it from shifting side to side. Furthermore, unlike many friction-style sway controls, the SwayPro allows you to back up your trailer without having to remove or disengage the system. Order: RelevanceNewestRating - High to LowRating - Low to High Shank fits 2" hitches and offers up to an 8" rise and a 2" drop. Clamp-on system uses optimal points of tension to help prevent sway while it balances your trailer's load for a more level ride. Works with underslung couplers. Excellent product and etrailer service 2nd to none. Very very happy after installation and a full season of use. Ive replaced the 1 socket with a 26mm socket, as it fits better. Only snag we are running into is that the u-bolts that hold the chains to the arms are being bent and worn down from occasional ground scrapes. Ive purchased a pair of the little u-bolts and four self locking nuts from e-trailer, so Ill be prepared if they ever do rub or break off completely. This system works great. Needs to have a better system to lock in the parts that go on your trailer rails. Sometime they come loose. The hitch works very well. Im not a fan of the wrench Blue Ox supplies to rotate the cams. I had a situation where the pin didnt lock the cam in place due to dirtsnow/ice but didnt notice. When I relaxed the tension on the cam, it rotated back down and smacked my had against the frame rail. I now use a 15 breaker bar with a 3 extension to give my hand some clearance- just in case it happens again! Well still very pleased with the Blue OX! Awesome hitch and all of my camping buddies are amazed at how easy this unit it to hook up. Installed theSwayPro WD system and found it worked well until recent trip. Decided I need the 1500 bars because od additional weight. What is your tongue weight on the blue ox ? I have a Keystone outback 277RL 35 feet and looking at a blue ox 1500 tw and wondering if this the proper one to buy. $645.87 may not install properly on a c-channel trailer frame. c-channel frames will need the bolt on bracket option part number: BXW4021. Hitch is doing its job! Semis arent an issue anymore so Im more relaxed when towing. Those big delivery box trucks have more of an effect than semis, but no problem. Happy I got this hitch. A year later and we have used this hitch many, many times and couldnt be happier with the purschase. Hook up is a breeze. Have had the chance on several occasions to get on the Interstate with the big trucks and wind and the sway control works. I am very pleased with the hitch. Thanks Blue Ox and eTrailer! William,The system you received is correct. Blue Ox has updated their weight distribution system and removed the thumb screw to help simplify the install and set up. Blue Ox has found that the tilt built in to the system is sufficient for the WD system. Well be updating the photos as soon as their available. The Blue Ox is performing fine, it does not eliminate sway but as long as I drive 65 mph or less, sway is rarely an issue. As you go over 65 sway can happen with adverse winds, semis passing, or poor road conditions. One other nuisance, is when I attempt to disconnect the chain on the right side, the chain sometimes gets wedged in the metal channel that you rotate and will not release. Usually I have to spray the area with a lubricant and then rotate the whole “chain engaging device” back and forth and the chain will become unstuck so that I can get the bar off. All else is fine, sometimes I do wish I had bought the Pro Pride but that seems a bit too complicated, heavy and expensive. This is a wonderful product. We pulled a 25 travel trailer on a long trip last year and I didnt have to worry about any sway on any road. The Blue Ox handles cross winds easy also. Very easy to use, I wouldnt buy anything else!